Remember my Spring Swirl set that I designed? Well, one of the designers at Sparkle N Sprinkle stayed up tooo late one night with ideas of how to use the umbrella image and I have recreated 3 of her ideas. I did a class on these cards this week and it was a hit for sure! Who woulda thought you could do sooo much with one little stamp!!! This beautiful butterfly was embossed with Firefly embossing powder which has Glow in the Dark in it! The sentiment was embossed with Midnight Madness. The swirls on the butterfly is Black Ice glitter applied with a Quickie Glue Pen. The butterfly is mounted on dimensionals then on the Lacey Circles Spellbinders Die. Here is the second card...and I believe my personal favorite, the bra. I used Princess Rose embossing powder for this one and adhered with dimensionals. The lace I found at Hancocks and I think is perfect for this occasion! There are several sentiments that you could use with this card from the Ribbons for the Cure and I embossed it with the Midnight Madness again. The fish card we made in one of the classes on the cruise. 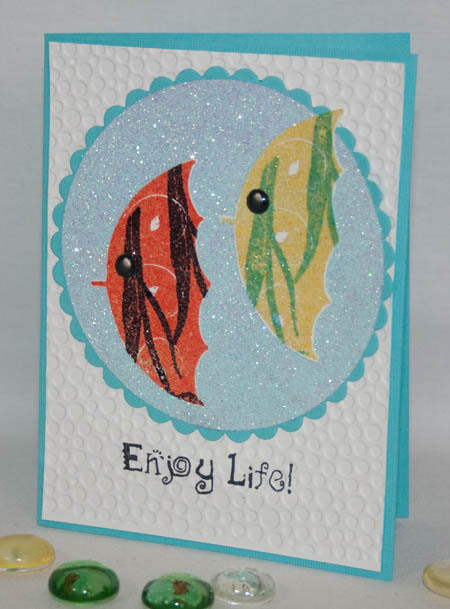 It was a hit, several of the stampers were confused and told me they were making the fish card and not the butterfly card with I handed them the stamp! The fish were created by double embossing, the one on the left was embossed first with Jack O Lantern, then for the stripes you stamp the stem of the Tulip stamp on the umbrealla and emboss again in Ebony Spark. The right fish was embossed with Kiwi ep, then the stripes with By the Lake. Then the umbrellas were cut out and placed on a circle sticker paper and then covered with Waterfall Glitter. These cards are great. I wish I had been able to join in the fun on the cruise. 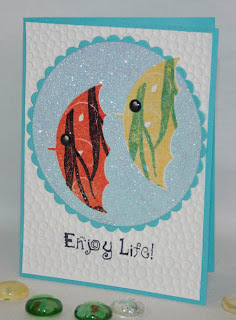 Hi Jillene I love the cards and would love the pdf on how to make them.I love getting the email updates from you.